Turkish Muslim community in German city of Cologne gathered to remember the New Zealand terror attack victims before the Friday prayer at the iconic Central Mosque. Thousands of Muslims showed up to pay tribute for the 50 victims as German Muslims themselves have been under increasing attacks in the past years. 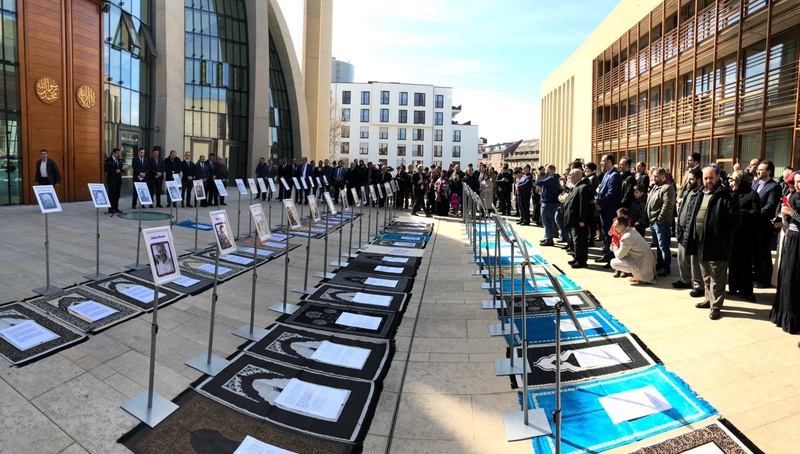 Germany’s largest Islamic organization DITIB displayed 50 prayer rugs for the 50 victims at the Central Mosque. Pictures of the victims were also displayed along prayer rugs. “Many Muslims are worried and a similar attack could take place on German Muslims anytime,” warned Burhan Kesici, head of Islamic Council an umbrella organization for largest Muslim NGO’s. Kesici based his statements on recent developments in Germany. He also pointed out that many muslim parents refrained sending their kids to the mosques this weekend out of security fears. More than 90 mosques have been attacked in Germany in 2018. And what is more worrisome is in 99 percent of the cases, the attackers have yet been captured. One of leading figures of Turkish community in Germany, academic Asiye Bilgin pointed out the very fact on her twitter account after the attack in New Zealand. She said as (German) police should protect mosques as they protect Synagogs. An incident that took place in Berlin on Tuesday just riveted the fears of Muslims. An head scarf-wearing Muslim woman was punched in the stomach at a train station in the German capital just a few days after the massacre in Christchurch, New Zealand. Turkish community in Germany believes German media and irresponsible politicians also have a big part on increasing of attacks on Muslims in Germany. German media regularly use an editorial line that fuels anti-Islam sentiments. One of the leading dailies in Germany, Bild, used a picture of the Cetral mosque in December last year, asking “if terror money was being used to finance mosques in Germany. DITIB, which operates the mosque pressed charges against the paper for inciting hatred. Germany’s embattled Interior Minister, Horst Seehofer is also criticized for constantly denying there is Islamophobia problem in Germany. Germany’s Schleswig-Holstein Education minister recently said Muslim community have collectively been held responsible after every single terror attack and we need to stop that.